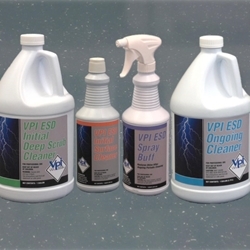 VPI 04001G ESD Ongoing Cleaner - Micro Parts & Supplies, Inc. Description: Formulated specifically for the on-going maintenance of ESD floors. Economical to use, Biodegradable, Environmentally safe, Pleasant fragrance, Meets or exceeds National Green standards for floor care. The pH balanced formula removes alkaline films and soils that dull along with other contaminates that can act to insulate the floor. It can be used daily, or as often as needed, to keep VPI ESD tile looking and performing at optimum levels.